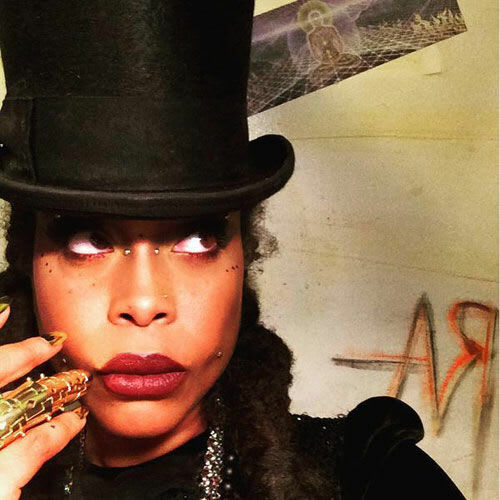 Erykah Badu is killing it: her remix of Drake&apos;s "Hotline Bling" is still in everybody&apos;s ears, her scheduled Thanksgiving mixtape might well overshadow a handful of other holiday releases, and she&apos;s the host for the about-to-air Soul Train Awards this year. We spoke with Badu in an interview published today, but there&apos;s obviously plenty of things we didn&apos;t get to talk about, and one of the best tidbits we&apos;ve learned about the singer recently came via a new feature with US Weekly in which she shares 25 fun facts about herself. The highlight? The Queen of Neo-Soul doesn&apos;t have a favorite rapper, and she&apos;s got a better reason than anybody else in the world. In addition to that absolutely perfect response, Badu also shared the scoop on her wardrobe—she owns "726 head wraps" and "7,221 pieces of ankh jewelry"—and even touched on her favorite body part: her colon. She also admitted that she&apos;s totally down for a bar fight—"Most people think I’m not capable of starting a bar brawl, but I will"—and dished on her celebrity crush: Billy Dee Williams. Read the whole feature here and catch up on our recent interview with the singer right here.